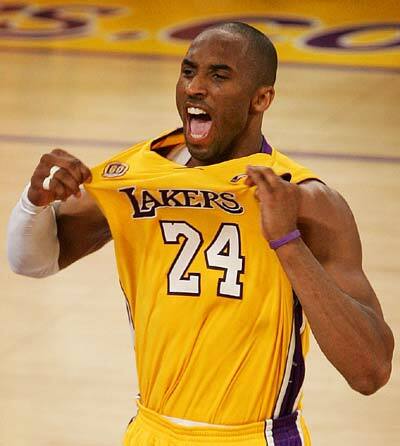 Kobe Bryant of the Los Angles Lakers is leading the overall voting for the 2011 NBA All-Star game, which is appropriate considering that the game will be played at the Staples Center in Los Angeles. Others leading the way for the Western Conference are Chris Paul at the one-guard, Kevin Durant and Carmelo Anthony at the forwards, and oddly, Yao Ming at center. Yao has been out for a bit now due to another injury issue and won't play in the game at all. When the coaches make their reserve selections, one of them will start in Yao's place. In the East, the leading guards in voting are Rajon Rondo and Dwyane Wade with LeBron James and Kevin Garnett in the lead in voting for forwards, and Dwight Howard at the five spot. The official starters will be named on January 27.